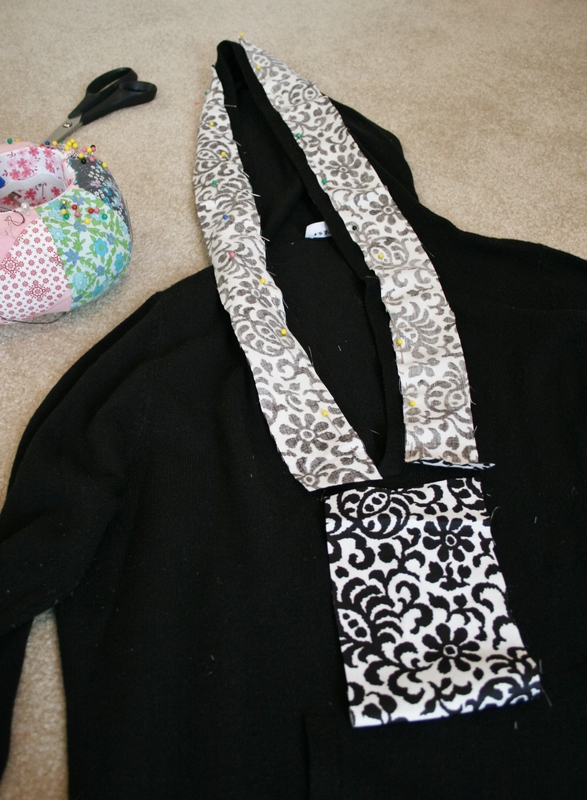 For the latest wardrobe tweak I performed some surgery on one of my old hoodie sweaters. 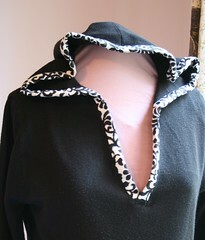 It’s a basic black hoodie with pouch pocket in front and I have gotten a TON of use out of this in the past. 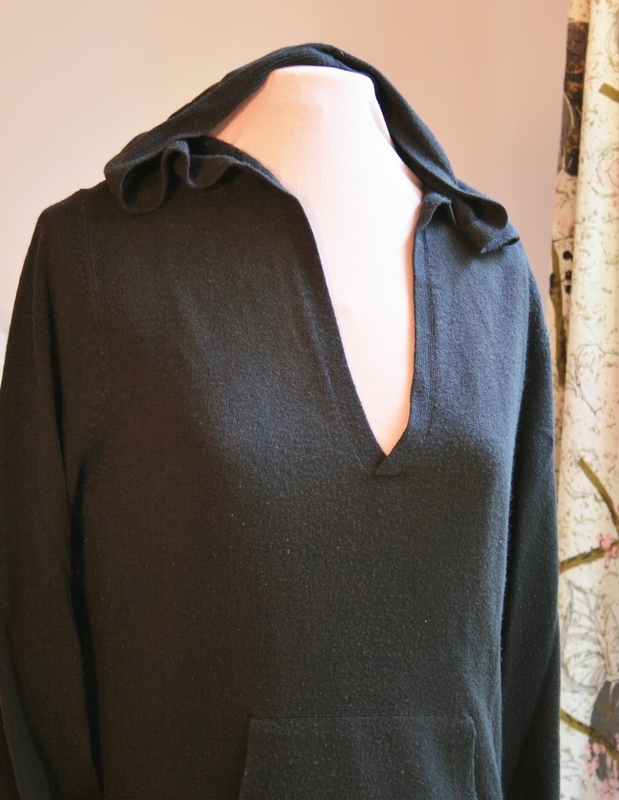 I had in mind adding a placket down the front in a contrasting fabric, not only for a change up in the look, but to add to the dimensions. It still fits fine, but has shrunken down from its original size. 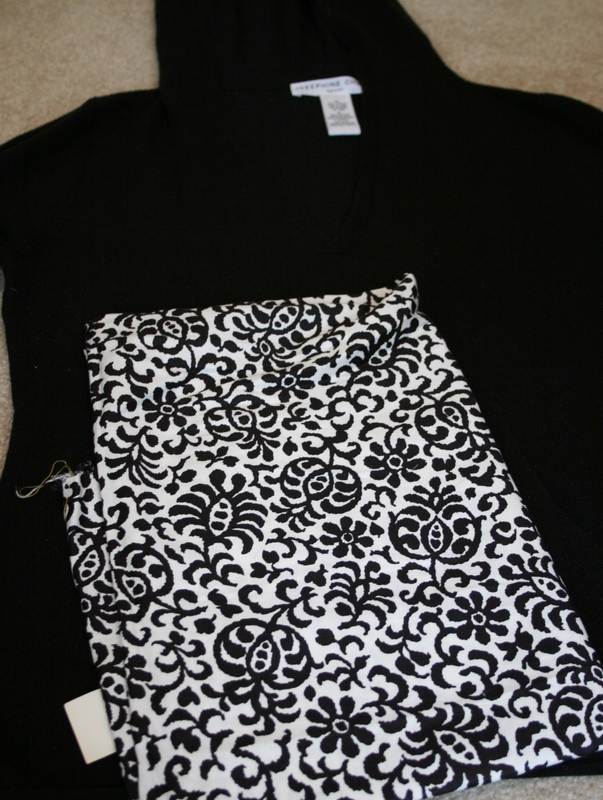 In order to make that happen I wanted to remove the pouch, add the placket and then re-attach the pouch pocket later. 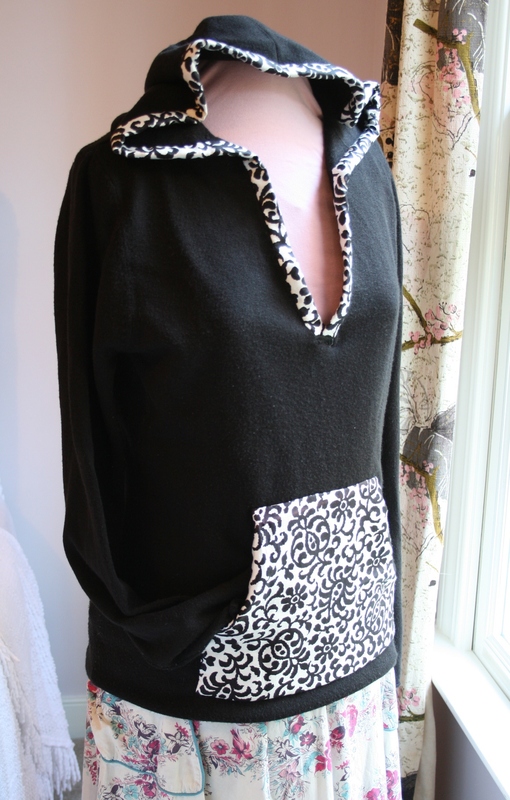 Unfortunately I discovered that the pocket was sewn on in a way that it could not be removed without risking all the knitting to come apart on the sweater front. So, it was back to the drawing board. After a nice shave to remove the pilling I got to work picking some fabric from my vintage stash. Since, I had planned to add a trim piece along the hood I decided to start there. 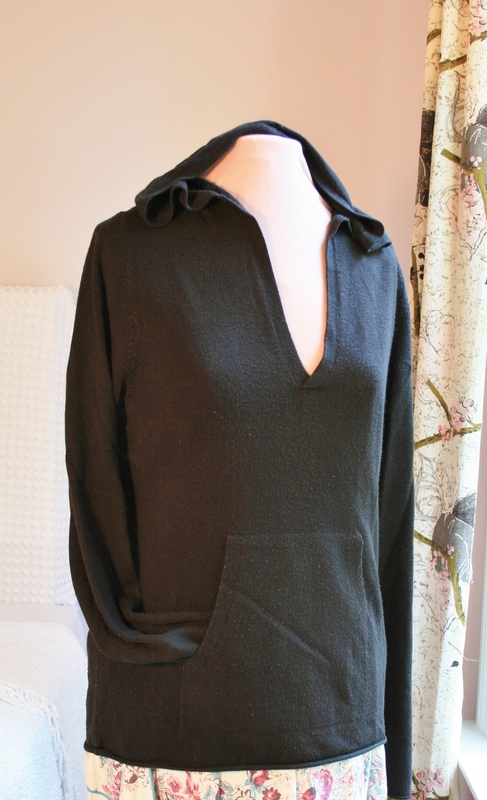 My first approach included the placket piece, but after my discovery about the pouch pocket I cut the trim strips away and stitched them to the front side of the hood. After securing the trim to the front of the hood, I turned the raw edge under and folded it in half, pinning it to the inside of the hood. I finished off the inside edge with a running hand stitch. 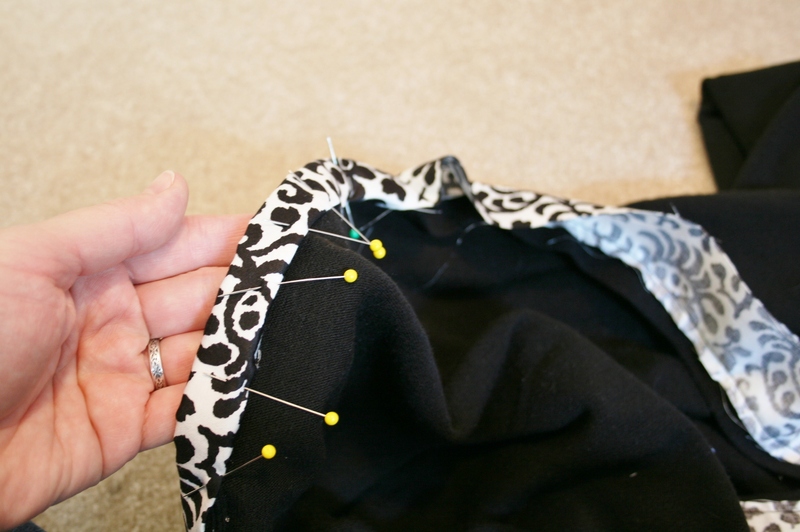 The entire time I was working on the hood I thought about how to approach the placket situation. Finally I decided to nix it altogether and just cover the pouch pocket instead. To make this easy I laid the fabric wrong side down over the pocket and marked an outline using a fabric marker with disappearing ink. 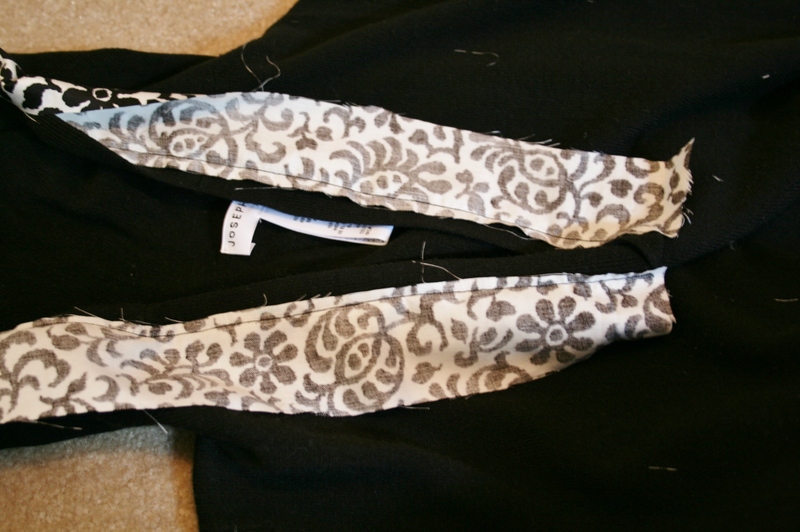 I trimmed around the outline leaving about a one quarter inch seam allowance. 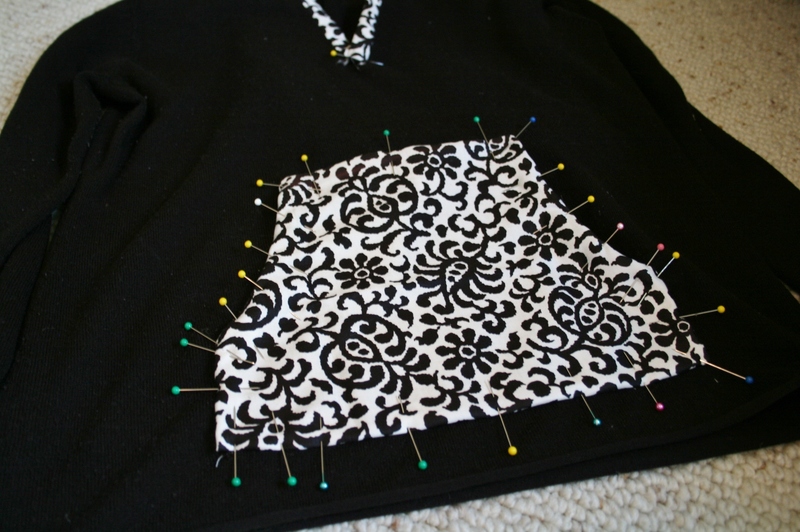 Then I flipped the fabric over and layed it on the pocket again. Next I tucked the raw edge under and pinned it into place. 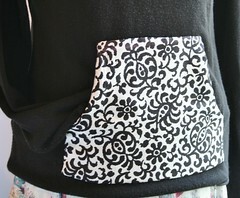 Just as I did with the inside of the hood, I hand stitched the pocket cover in place. In a way I think the simple contrast of black and white, but in a more formal pattern, really classed this hoodie up. I have always been a fan of clothing that can be dressed up or down, and I think this piece would look great with some nice jeans, knee boots and cool jewelry for a casual evening out. What do you guys think? A hit or a miss?